The National Legionary State took power upon the abdication of King Carol II. Carol was forced to step down largely as the result of a series of humiliating losses of territory. The first was on June 28, 1940 when Romania had to withdraw its military and administration from Bessarabia and northern Bukovina to avoid open war with the Soviet Union that issued two ultimata on the 26th and 27th. Romania lost over 50,000 km². The Second Vienna Award, August 30, 1940, passed 43,492 km² in Northern Transylvania to Hungary. Also, the Treaty of Craiova, looming at the time of Carol's abdication, was signed September 7, 1940 and returned Southern Dobrudja (the Cadrilater) to Bulgaria. On 20 September, the population exchange between North and South Dobruja began, and was finished by 1 October. The first Romanian government to be overtly aligned with Nazi Germany and the Axis, the National Legionary State was marked by uneasy relations between Sima and Antonescu. The regime was officially proclaimed on 14 September, after the King's abdication and the new borders imposed by the Vienna and Craiova treaties were set. During the period of the National Legionary State, 20 antisemitic laws were passed. On 20 November, the regime awarded wide autonomy to the German minority in Romania. On 23 November, Romania signed the Tripartite Pact, thus formally joining the Axis Powers. 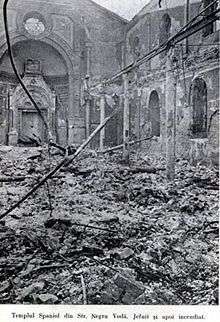 On 26 November, the Jilava massacre was conducted against former political opponents of the Iron Guard. The regime ended with the widespread violence of the unsuccessful Legionary Rebellion (January 21–January 23, 1941), in which the Iron Guard attempted to seize full power but was, instead, defeated. 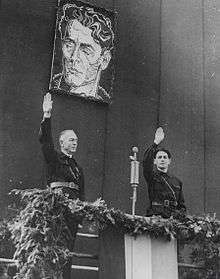 Romania was proclaimed a "National and Social State" on 14 February with Antonescu as sole dictator, thus officially ending the National Legionary State.